This is a picture of Weimar Germany during their period of Hyperinflation. Wheelbarrows of money bought a loaf of bread. People used money for wallpaper because it was cheaper than using wallpaper. Serious condition? Yes, that's very serious. Much more serious than the United States Great Depression. And Germanys hyperinflation wasn't the worst in history. As a matter of fact it was the 5th worse. The worse was Hungary when rated on a scale of the average daily inflation rate. 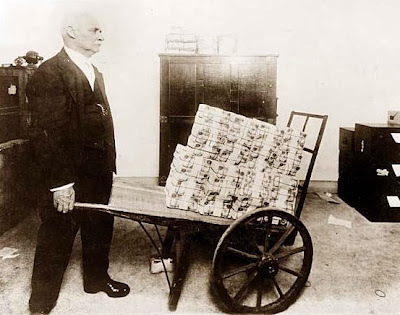 Hyperinflation has happened time and time again in history, each of which were caused by the government printing massive amounts of excess money which devalues the currency. It's often used as another way to tax the people without them knowing it's happening. Your money is worth less due to inflation. More money in the system makes your one dollar worth less than one dollar as there is more to go around. Less money in the system makes your one dollar worth more than one dollar as they are harder to come by. The government has preached to the people that a little inflation every year is good. Good for who? Them or you? I'll give you a list of a few of the countries that have suffered hyperinflation over the past 90 or so years. Hungary, Zimbabwe, Yugoslavia, Germany, Greece, China 2 times, Danzig, Armenia, Turkmenistan, Taiwan, Peru, Bosnia, Herzegovina, Ukraine, Poland, Congo (Zaire), Russia, Bulgaria, Moldova, Soviet Union (prior to Russia), Georgia and Tajikistan. Many of these have been since the 1970's. So, yes, it has happened many times in history and there is plenty of history to determine how and why it happens. Typically hyperinflation takes place about 5 to 9 years after the representative government has printed additional currency with nothing to back it as the United States has done countless times over the past few years. And interest rates have been kept very low for a number of years now to hold off the inevitable. So what does inflation have to do with Real Estate? Stable Currency: If there were no inflation and no deflation than the price of real estate would remain relatively stable. It would have ups and downs based on population, supply and demand as a result of population fluctuation, and other cyclical events. Drastic change one way or another can be very scary. Massive wealth is made during times of drastic change. Massive wealth is lost as well during times of drastic change. A stable currency is not a Fiat currency as we currently have that's backed on nothing but the worlds personal perception. Rather it's a currency that is backed on a globally traded equity such as a precious metal. All fiat currencies in the past have failed. That's right. ALL. EVERY SINGLE ONE. And there have been many. Those who are not positioned correctly will suffer tremendously. Those who wish to protect themselves will spend time understanding inflation or at least follow people who you are confident that do. That's why I'm writing this article for the group. I would like to start an ongoing dialogue on the subject. I'm no expert but I am learning about it and have a pretty good grasp on how we are affected by it. Hyperinflation: During hyperinflation on the front side real estate goes up in value. The cost of all goods go up in value as the dollar won't buy as much as it used to each and every day it decreases in value due to the inflation. Mortgage rates increase as they reflect interest rates and interest rates tend to go up with inflation. Rents increase some but not comparitively to afford the higher adjustable mortgage rates. Tenants that are on fixed incomes such as the elderly and recipients of disability checks will suffer the most and landlords who rent to them will find great difficulty in obtaining rent. Landlords who use year to year leases and have mortgages will suffer. They would be better off with month to month leases as they can adjust the rent as needed when adjustable rates drastically increase. A moderating factor on the back side of hyperinflation is that when mortgage rates go too high people will stop taking out home loans and and the supply of available property will increase significantly causing a big pop of the housing bubble hyperinflation quickly creates as home prices drastically drop in value. I have been a strong believer that the United States will face hyperinflation due to our politicians inability to adequately control their spending of our money. My beliefs are based on historical events and if you know history you can read the future in many cases as we all know history repeats itself quite frequently. Here's another look on what will happen regarding inflation as a result what they have done to us. This analyst has an interesting spin on the subject and feels more or less that people will suffer but it won't be as a result of hyperinflation but rather a result of a necessary pay down of the debt. They cover how the debt will be paid down and with who's "entitlements". It's a long article that I didn't feel like reading but wanted to know about so I took the cheesy way out by copy and pasting it into a word document and then highlighted it all and had my computer read it to me. Great post Dallas. I met a Pharmacist/diamond mine owner from Canada back in 2009 in HI that got my wheels turning on this and it's the scariest subject I've ever studied. If you haven't read 'The Great Super Cycle' you should grab a copy today. It will scare the sh*^ out of you and take you to a whole new level of hatred for the Federal Reserve but it is an excellent history book and guidebook for the coming decade. Keep the great content coming!! Sorry, haven't checked comments on the blog for a while. I'm going to check that out. Sounds like a very interesting book!